Woods, a rare conservative in Hollywood, typically tweets political statements to his 1.84 million followers, but the actor has taken his own advice and used his massive platform to help with issues pertaining to the deadly fires. 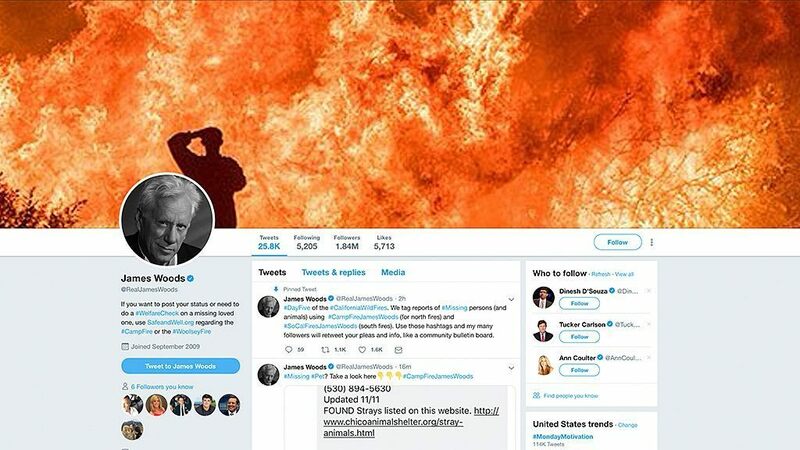 Woods even changed his bio and pinned tweet to information aimed to help victims find missing loved ones as his Twitter feed has morphed into a comprehensive fire survival guide for California residents. Woods has been tweeting non-stop, with messages ranging from tips to keep animals safe to lists of items needed to safely evacuate. The actor is using a series of hashtags to help centralize the information he is distributing. Woods tags his messages with #CampFireJamesWoods for the Northern California fires and #SoCalFiresJamesWoods for the Southern fires, in addition to hashtags such as #WoosleyFire, #Malibu, #Chico and #Paradise to help narrow down locations. oods adds #DisaterAnimals or #CampFirePets when his message is aimed to help lost or displaced animals and #GoodSamaritan to put a spotlight on anyone looking to offer shelter, food or supplied to a displaced person. The famed actor was one of the first celebrities to bring attention to the deadly fires and he has not slowed down. He has urged followers to foster pets, shared messages seeking volunteer veterinarians and even distributed information about local colleges impacted with cancelations. In one tweet, Woods admitted he was typically “hesitant to recommend donation sites” because of “scammers,” but vouched for a list of places to contribute that he vetted. Woods has advised followers to leave water outside for wildlife that could be “parched by the fires,” leave window signs notifying first responders that you are ‘safe and gone” and instructed evacuees to make outgoing cell phone messages with updates to inform loved ones in case a battery dies.